Description This is a Forward-Back Tension Measurement tape (Part No. J-6080-003-C / SL-0003C) which is used to accurately set the tape tension on a Betamax machine. Setting the back-tension too high results in excessive head and drum wear. Too low and the tape will not be held tightly enough against the heads resulting in poor picture quality. This is the same symptom as if the heads were worn so be careful. Extremely low forward-tension will result in the tape not being wound on to the take-up spool. When this happens the VCR will shut down into Stop mode. High forward tension will result in distorted audio and increased wear on both the audio and video heads. 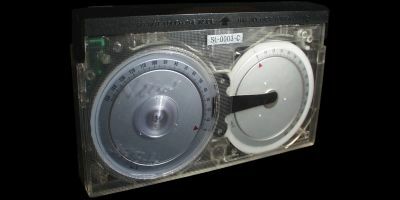 Remove the upper panel so that the tape path is visible. Insert the torque cassette and press PLAY. Read the supply reel side of the meter after the indicator has made about one whole revolution. The correct value for this should be between 45 and 48 gcm. N.B. Make sure that the unit is level when measuring. Also, once the measurement is complete, press stop. If the tape goes slack, first put the unit into forward mode first to remove the slack before the tape is ejected. On an SL-C9, the forward/back tension can be adjusted by using the RV002 control on the SS-11 board. Most Beta models however, have a mechanical tension regulation system making use of a back tension band. With this design back tension is adjusted by moving the end of the tension band. This can often be a very tiresome task as adjustment of the band often requires removal of the reel chassis to gain access to the tension band. See also the head cleaning guide.